Composed in the aftershadow of SUNN O)))’s most recent successes in immersive collaboration — the group having worked with Scott Walker on Soused, and Ulver on Terrestrials in 2013 and 2014 — and also from the broad and influential wake of their epitomic Monoliths & Dimensions, Kannon emerged both independently as a conceptual entity and with roots in the legacies of those projects, yet was fully realized years later in 2015. The album consists of three pieces of a triadic whole: “Kannon 1, 2 and 3.” The album celebrates many SUNN O))) traditions; Kannon was recorded and mixed with SUNN O)))’s close colleague and co-producer Randall Dunn in Seattle, in Studio Litho, Aleph and Avast!, and the LP includes performances by long term allies and collaborators Attila Csihar, Oren Ambarchi, Rex Ritter, and Steve Moore to name a few. At the core, the composition centers around the dynamic and intense guitar and bass interplay of SUNN O)))’s founders: Stephen O’Malley & Greg Anderson. 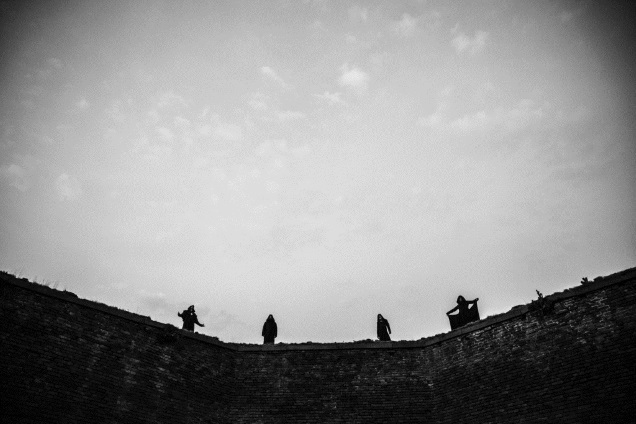 It is possibly the most figurative album SUNN O))) has created, which is unusual as they usually dwell in layers of abstraction and subjectivity. On the other hand the album is the most outright “metal” in years, drawing personal associations and memories of cherished albums like Panzerfaust and Twilight Of The Gods again to the forefront of consciousness. Kannon is also very close to the cyclical character of mantra which the band has evolved into as a living creature, the enormity of intense sensate detail and manifestation of the live in concert element of SUNN O))), the organism that has flourished, metamorphosed and transcended tremendously over the past ten years. The literal representation of Kannon is as an aspect of Buddha: specifically “goddess of mercy” or “Perceiving the Sounds (or Cries) of the World.” She is also sometimes commonly known as the Guanyin Bodhisattva (Chinese: 觀音菩薩) amongst a plurality of other forms. There is a rich lineage behind this idea tracing back through many Asian belief systems, with as many names and cultural personifications of the idea. SUNN O))) commissioned critical theorist Aliza Shvartz to write text and liner notes around these ideas and topics. She also explores the relations and perceptions to their approach to these ideas via the metonym of music and SUNN O)))’s place/approach within the framework of music and metal overall. The band also enlisted Swiss designer/artist Angela LaFont Bollinger to create the cover artwork, an abstracted sculpture of vision ofKannon. French photographer Estelle Hanania captures portraits of the core trio (Csihar, Anderson, O’Malley) in the impressive and obscurant Emanuel Vingeland mausoleum in Oslo. Kannon will be available on gatefold LP, CD and digital formats worldwide on December 4th, with a limited number of clear vinyl available on Black Friday RSD, Friday, November 27th. 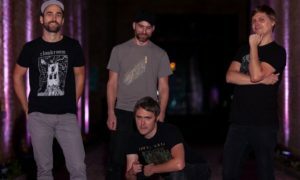 NIGHT BIRDS streaming new album “Mutiny at Muscle Beach”!